Researchers took a unique approach to love: they applied the scientific method to quantify exactly what makes a relationship beautiful and blissful … and what makes it ugly and painful. They gathered data from 3,000+ couples for 40 years and counting. One initial study placed couples in “Love Lab” apartments, where they were monitored, observed and recorded. Researchers followed up with many of the couples for more than 20 years. Using the data, our marriage experts can now accurately predict which relationships will end in divorce. Discover The Art and Science of Love at our world-renowned weekend workshop for couples based on Dr. John Gottman’s research. 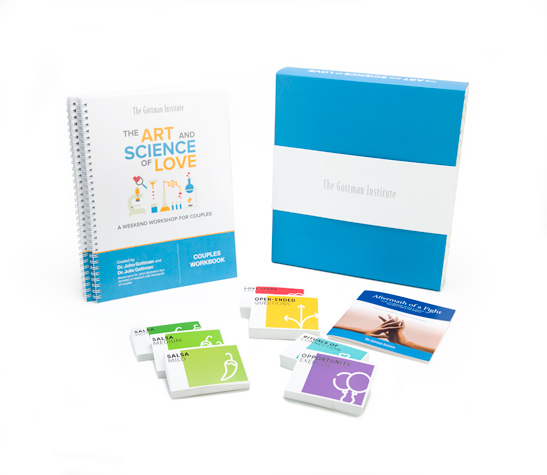 The Art and Science of Love is a workshop for couples in all stages of their relationship and has been shown to achieve positive results similar to 6 months of couples therapy. Why? Because it is based on proven methods and relationship concepts. You’ll go home with a package of techniques, cards, tools and tips to continually elevate your relationship. Our curriculum is developed from 40 years of research with more than 3,000 couples. It’s grounded on what actually works in relationships that are happy and stable, not idealistic notions or anecdotal evidence of what marriage ought to be. The workshop has produced positive results for 94% of those who attended based on 2016 exit surveys but don’t just take our word for it. Caralee Frederic, LCSW, CGT, has practiced as a private couples and individual therapist in Colorado, specializing in marriage and family counseling for almost 20 years. Founder of Principle Skills Relationship Center, Caralee is also a Certified Gottman Therapist, presenter of The Art and Science of Love couples workshop, and a Certified Sexual Addiction Recovery Therapist. She is a Level 1 and Level 2 Trainer for Gottman Method Couples Therapy. Cancellation and Disclaimer: In the event, you need to cancel please contact Principle Skills Relationship Center, LLC at becky@principleskills.com. Requests received at least 21 days prior will receive an 80% refund. Less than 21 days there is no refund, however, you may transfer to a future workshop hosted by Principle Skills Relationship Center, LLC within 1 year of the date of cancellation. The individual or entity that made the arrangements to attend the Principle Skills Relationship Center, LLC event agrees to hold harmless National Marriage Seminars, Inc., its directors, and employees from any and all liability associated with those travel arrangements. By registering for any Center for Relationship sponsored or hosted event the individual or entity agrees to these terms.